I love to try new foods, hence the birth of this product review website. I’ve had my share of chips and popcorn but I also get bored of eating the same old snacks. Today, it’s a cloudy day and the husband went out to go pick up some groceries (meat for dinner, milk for the kid, and I asked for a snack). He said he wouldn’t pick up chips but he would bring back a snack. Since I’m not the one leaving the house, I agreed he could pick. See how diplomatic I am? The husband returns home with a bag of popcorn and I’m not exactly jumping for joy since I didn’t really feel like cheesy popcorn. But, I did take a moment to read the bag and it turns out that the Popcorn Indiana – Original Kettlecorn popcorn isn’t the cheesy type but is supposed to be sweet and savory. Ah, finally, something different! I snip open the bag and dump out a pile of the Popcorn Indiana – Original Kettlecorn popcorn into a bowl and take a dive. True to its word, this popcorn had a hint of saltiness and a dash of sweet perfectly balanced with its popcorn crunch made crunchier by the light coating of flavor. This is going to sound weird, but after eating it, the after taste actually tasted like roasted corn. That sounds odd, doesn’t it? But I’ll be honest, I’ve had other popcorns and at the end, you either taste nothing or there is a funky preservative-type aftertaste but not so with the Popcorn Indiana – Original Kettlecorn popcorn. It really just had a roasted corn aftertaste, very cool and natural. That’s when I decided to look at the ingredient list. Shall I tell you what the ingredients are? Brace for it: popcorn, sugar, canola oil, and salt, in that order. No other things that I can’t pronounce or recognize. That’s it! No wonder it tasted so real. Well, on day one, the husband and I enjoyed the popcorn to its fullest, but no, we didn’t finish the bag. The husband says he likes it, he likes the flavour and that it tastes fresh. Oddly enough, despite being such a natural product with only those 4 ingredients, I can’t say I’m wowed. Somehow, it doesn’t seem to agree with my throat which has this scratchy feeling. Now, that could be because I ate too much but let’s face it, I’ve eaten ‘too much’ of other foods too and they didn’t all give me that scratchy throat feeling. I’m certainly not allergic to the ingredients but it may just be that this popcorn treat isn’t my ideal popcorn treat, although it is promising. 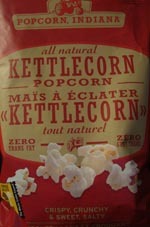 So, would we buy Popcorn Indiana – Original Kettlecorn popcorn again? Yes, the husband and I both agree we’d buy it again despite its heftier price tag, just not as often. He’d also be the one eating most of the bag since he hasn’t noticed any of that scratchy throat feeling. It may be his newfound treat, just not mine.